There was a buzz at Lancing Manor park earlier today as a swarm of bees took over a park bench. According to pensioner Keith Stainer, who took pictures, there were more than 20,000 honey bees in the swarm. 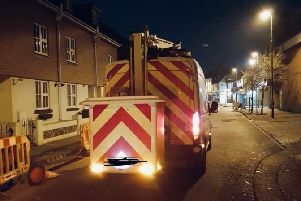 He said that a woman sitting on the bench called Adur District Council this morning and the area was cordoned off as a result, with beekeepers called to the area to rehome the bees. “Apparently you can only have one queen bee per swarm, so if the queen lays another queen, they have to leave to start their own colony,” said Keith, from Sompting. In a tweet, Adur District Council said: “As the swarm was only four feet from the ground, and in a park that is busy with children and dogs, we took the decision that it had to be moved. “The bees were not too co-operative as they followed the queen onto the picnic bench instead of into their transit box.